The Georgia Army National Guard is made up of more than 11,000 citizen-soldiers who train in more than 79 hometown armories and regional facilities across the state. They not only respond to disturbances and natural disasters in Georgia — such as the recent Hurricane Irma — but they also fight alongside our nation’s military on battlefields around the world. And when the Guard deploys its soldiers to fields both international and domestic, it’s a Georgia Southern University College of Education alumnus who now leads them. On Sept. 15, Gov. Nathan Deal appointed Col. Randall Simmons (‘95) to the position of Assistant Adjutant General-Army and Commander of the Georgia Army National Guard. In this role, he is responsible for making sure all Army Guard units are always ready, and always there when needed. A Statesboro native, Simmons says he spent most of his educational years at Georgia Southern, where his mother worked during his early elementary school years. He attended the University’s Pre-K program, and then attended the Marvin Pittman Laboratory School for grades K-8. He only left Georgia Southern long enough to attend Statesboro High School for four years, and then returned for his undergraduate degree in secondary education. Simmons didn’t envision a military career after graduation. Instead, he pursued a career as a teacher and a coach — positions that left a lasting impact on him. While also fulfilling his traditional guardsman duties, he served at Burke County Middle School and Southeast Bulloch High School before a military career opportunity came knocking. “Once I joined the Guard, I realized it kind of filled a void after high school — being a member of a team,” he said. “Most people that have experiences with high school athletics just like playing, like being part of a team, and being a part of something bigger than themselves. 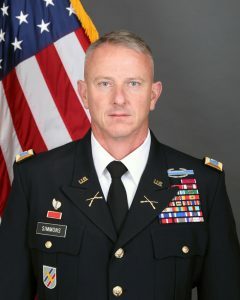 During his military career, Simmons served tours in Iraq and Afghanistan as part of the 48th Infantry Brigade Combat Team, and was promoted to Brigade Commander in 2013. He has served as the Chief of Staff for the Georgia Army National Guard for the last three years. He credits Georgia Southern with teaching him how to be a student and lifelong learner. At the University, he found engaged faculty who helped him gain confidence and achieve academic successes far beyond his college education. In addition to Officer Candidate School and many other military schools, Simmons attended the U.S. Army War College in Carlisle, Pennsylvania, where he earned a master’s in strategic studies in 2013. Simmons’ ties to the University are still strong, and he works closely with Eagle Battalion, Georgia Southern’s award-winning ROTC program. The Guard has installed two active-duty guardsmen to work with Eagle Battalion full-time, a deal that Simmons says benefits both parties. Whether visiting his family in Statesboro or visiting Paulson Stadium on game day, Simmons says he will always have a special connection to his alma mater. And in his new role, he hopes to represent his school, his hometown, his state and his country with Eagle Nation pride.